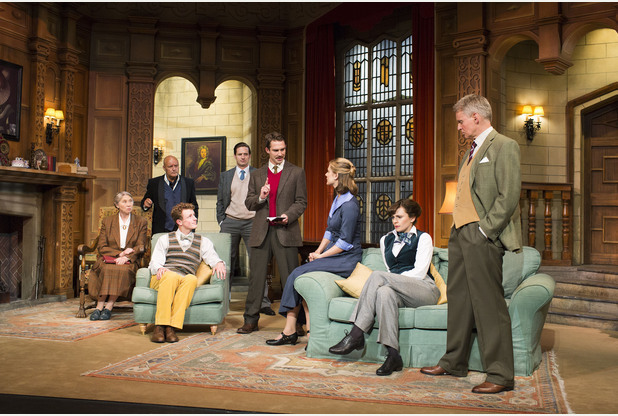 The 60th Anniversary touring production of The Mousetrap has now arrived at Watford Colosseum and it is no wonder that this absorbing play has endured for so long. Following the vicious murder of a woman in London, Sergeant Trotter (Jonathan Woolf) arrives at a hotel when it is suggested the next victim may be at this address. It is up to Trotter, and the audience, to uncover the connection between the murderer and the hotel before it is too late. The excellent cast engage us in their individual intrigues and as the plot unfurls we suspect various characters in turn, from the young couple embarking upon their new hotel business to their various paying guests. Joanna Croll plays a convincingly naïve young hotel owner, Mollie Ralston, and is well supported by Henry Luxemburg as her loving husband, Giles. Michael Fenner, who continues his West End role, adds some humour to the proceedings as the mysterious Mr Paravlani, taking pleasure in mocking the situation the guests find themselves in. Ryan Saunders portrayal of the over enthusiastic Christopher Wren is both amusing and endearing, as he befriends Mollie and tries to help in the kitchen. However, beneath the perfectly respectable impression they all wish to portray, can you guess who is hiding the darkest secrets? This play is perfect for the amateur sleuth, and currently boasts a talented cast on tour, but remember to keep the secret to yourself when you finally discover the truth.